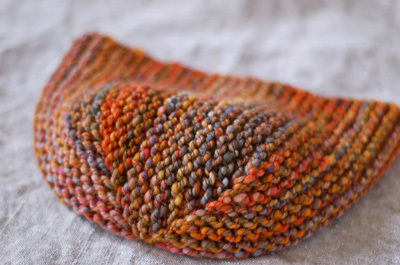 Colorway: Adrian is a Fancy Pants! Needle: Can you believe I’ve already forgotten? This pattern is super interesting to me, both in construction method and adaptability. Choose your gauge (within reason- you are instructed to use worsted or bulky weight yarn) and size, plug your numbers in, and away you go with a custom pattern. So cool. I’ve got to say, I had a little trouble understanding the pattern. In the instructions, part 7, there’s mention of wrapping, but you’re not actually instructed to do it on that row. I did and things look fine. Then in part 13, you get “you may need to add one extra row because you mustâ€¦” ??? I think this refers to a row you might have to add if you are given an odd number of rows to knit, but the vagueness made me nervous! I laid out my knitting at the 1/8 and 1/4 marks and measured to be sure I was on track before continuing, just to be sure. Again, things worked out fine and it was nice to be reassured that the hat would be the proper size. Any problems with the pattern could totally be on my end, but I figured I’d mention what I did and that it worked out, in case you make the hat and have doubts about what to do, as well. Siri asked in the comments to the last post about what made the Finn wool used for this yarn so special. Oh, let me count the ways. Mainly, it’s the luster. It’s not common to get wool with the great combination of luster and length plus fineness that this particular shearing had. You usually get luster and length in longer-wooled breeds with coarser fiber, and fineness in shorter-wooled breeds. Having them all in one wool was glorious! This wool sucked up the dye and showed colors so well with it’s soft sheen, the slipperiness of the fiber made for a very easy spin, and it was soft enough to wear against any skin. See why we pine for it? The next year’s shearing was like coarse hair in comparison. It was sad day, indeed. Sorry there’s no photo of the hat on. I’m running around like a lunatic, trying to square everything up for my trip to MA Sheep and Wool this weekend, and I’m not fit for public consumption. I will be tomorrow, though, I promise! Carolyn and I should be there both days, visiting Amy’s booth a whole lot and shopping our heads off. Look for us! I got new lime and orange glasses. You can’t miss’ em! I love how totemic it is as an object. Oh, so pretty! I love the texture and color. 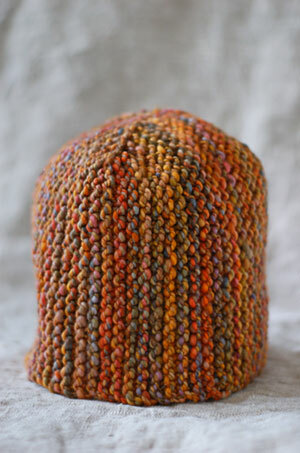 Beautiful handspun which sets off a great hat. Lovely texture too. You are a fancy pants, arent’ you! Lime and orange–mmm hmm! 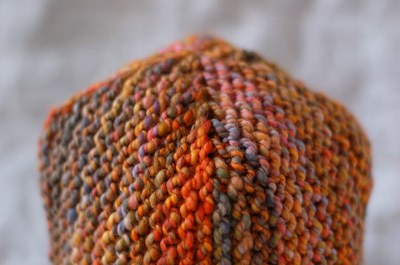 I adore the handspun and garter stitch things you’ve been making. I’m still waiting to see the awesome glasses! Oh, that is brilliant construction. As always, you have great color taste!! !